A few weeks ago, while driving in New York City, I witnessed something I hadn’t seen in nearly two decades of living here: A pedestrian struck by a car. I wrote about the experience, and its repercussions, in the New York Times. One section that got cut from the piece, for space, was a brief chat I had with Dr. Lewis Goldfrank, who is, among other things, the Director of Emergency Medicine at Bellevue Hospital. He mentioned that that facility’s trauma section sees roughly 15 people a day involved in “motor vehicle crashes” (like many in the medical profession, Goldfrank eschews use of the word “accident,” as many of these instances involved quite preventable circumstances, like alcohol or speed). He also stressed how the seemingly fleeting injuries picked up in a crash can have lingering effects. “Even contusions, concussions, and transient loss of consciousness can prevent return to normal activity,” is how he put it. Thanks again to Bart Dellarmi for talking about his difficult experience, and here’s to his speedy recovery. 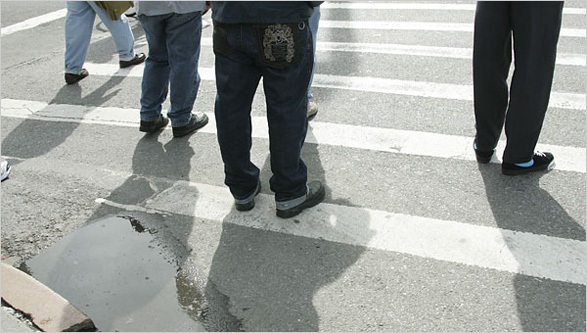 Comments Off on 10,000 Pedestrian Injuries Is a Statistic, One is…. Click here to leave a comment.